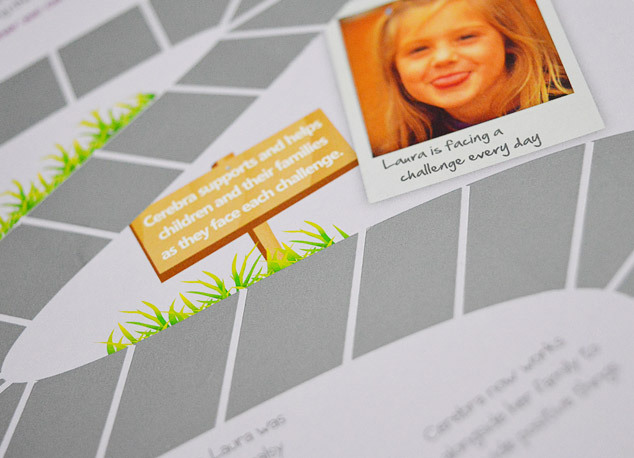 Finishing can add that all important difference between a brochure being simply good and memorably stunning. This section will guide you through the wide range of finishing treatments currently available at Cedar. 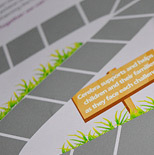 Each offers best practice examples to help you choose the best enhancements for your printed project. 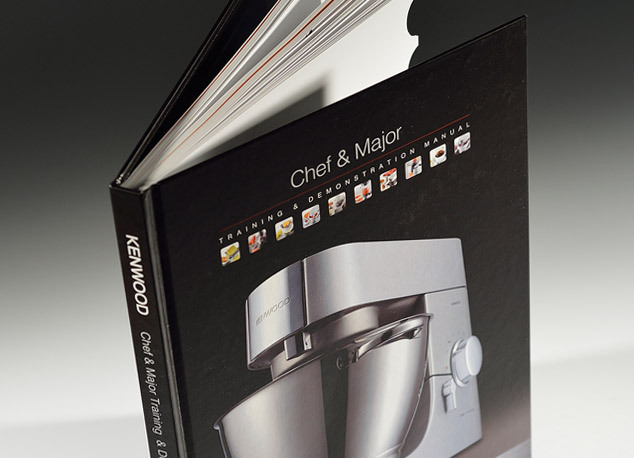 Consistently one of the favourite binding finishes used, Perfect Binding is an economical and functional finish that gives books a clean, attractive appearance. 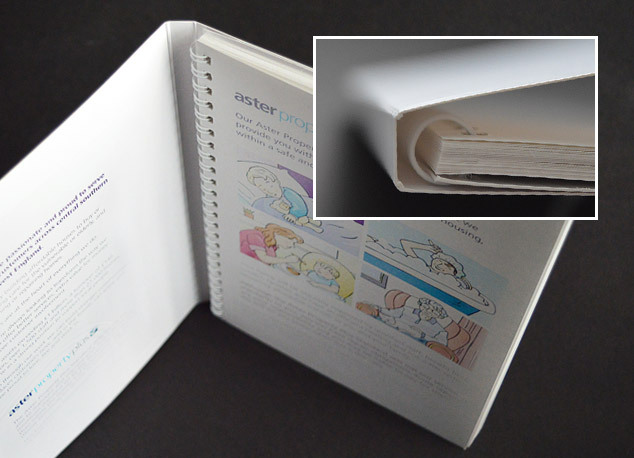 Perfect Binding is an adhesive form of binding which works by gathering folded multi-page text sections on top of each other to form a book block, the edge of which is then roughened and flattened. 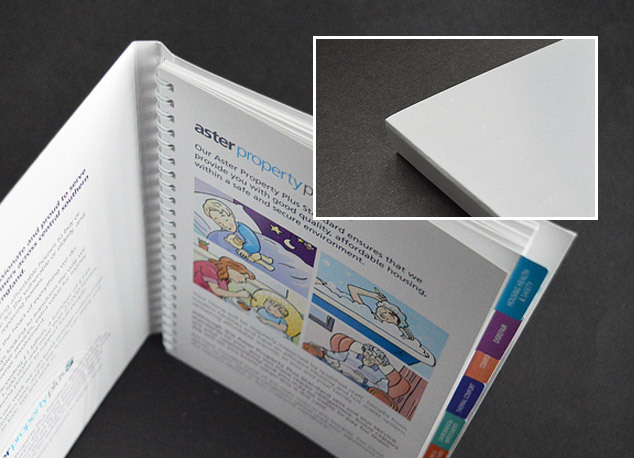 A flexible adhesive is then applied to attach the book block to the spine of the cover, creating a high quality finished document. 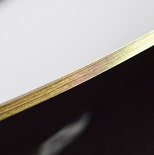 Burst Binding is similar to Perfect Binding, but in this case the spine of each section is notched to allow the glue to penetrate it, giving a slightly stronger bind. However, the spine is not as square as Perfect Binding, with the notches visible when the book is pushed down and spread open. PUR Binding is named after the adhesive used in the process - PolyUrethane reactive glue. This is the most durable binding glue available, offering design flexibility for any number of applications. PUR provides a tough, pliable bond that is also resistant to temperature extremes. The page-pull strength of a PUR bound book is more than 2.5 times that of a standard Perfect Bound book. Books bound with PUR adhesive will not fall apart under heavy usage in even the most demanding of conditions. 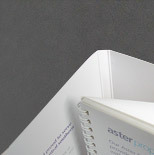 At Cedar most of our books are produced using the PUR binding method to ensure quality and durability. 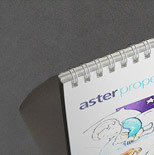 TIP: Adding spot UV and Foil finishes to the cover of these bound books adds an extra touch to the finished product. Thread Sewing provides the extra strength needed when a book will be opened and handled a lot, giving your document a longer lifespan. 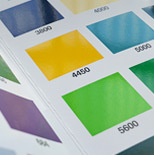 It is usually used on premium quality and high profile print. A sewn book block is attached to a paper or board cover by gluing it into the spine and then trimming to its final size. The sewn block is created by gathering folded text sections, and passing threads through the spine of each section. These are then gathered together on top of each other and thread sewn again, joining all the sections into the finished book block. Thread Sewn books tend to lie flatter when opened as opposed to a Burst, Perfect or Saddle Bound book. 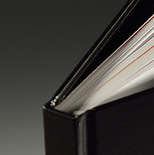 While PUR Binding will provide a similar look and feel, Thread Sewn is the most durable binding method for soft cover books with heavy coated stock. 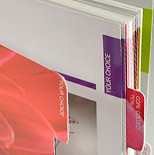 Case Binding is considered the ultimate binding method in terms of look, quality and durability. 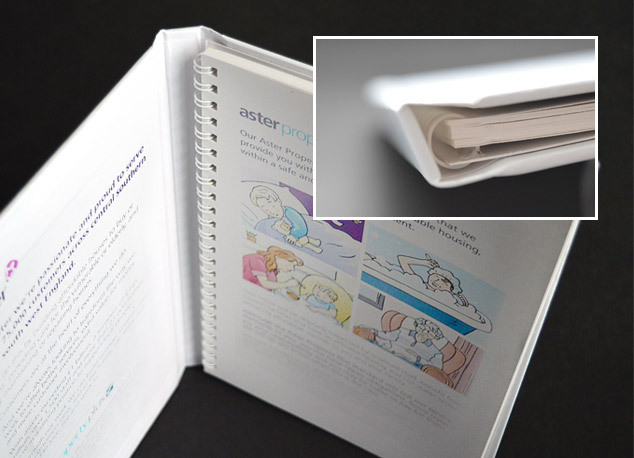 It also provides a hard cover binding option as opposed to Perfect Binding, Burst Binding, PUR Binding and Thread Sewn, all of which use a soft cover. 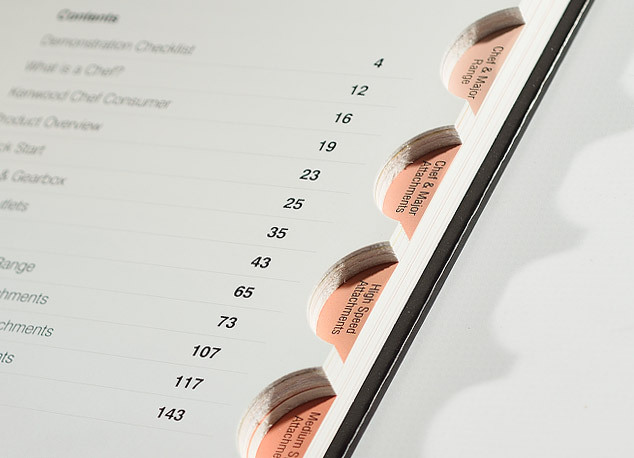 As with other binding methods, Case Binding gathers folded text sections on top of each other. These are then thread-sewn together to form a book block. End papers are then attached to the first and last sections of the book block. This book block is then PUR glued into the hard back case (cover and spine). This case will be made of binder board which is covered in paper, fabric, plastic or leather to form a long-lasting, high quality finish. 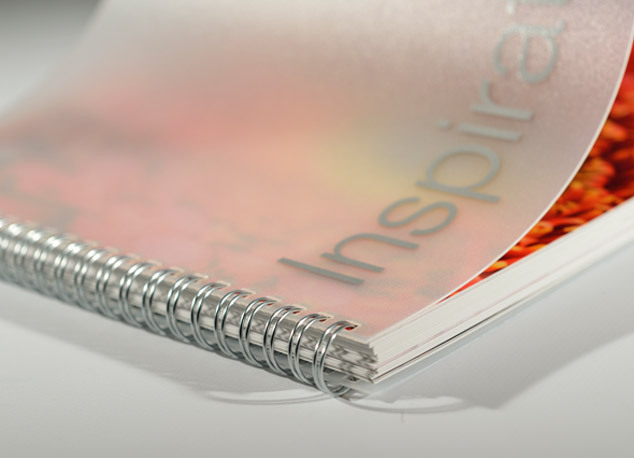 TIP: Adding spot UV and Foil finishes to the cover in addition to Case binding adds an extra ‘wow’ factor to the finished product. “Stapled” in common parlance, Saddle Stitching is a very popular form of finishing. It is a quick and effective method of binding lesser paginated documents together. 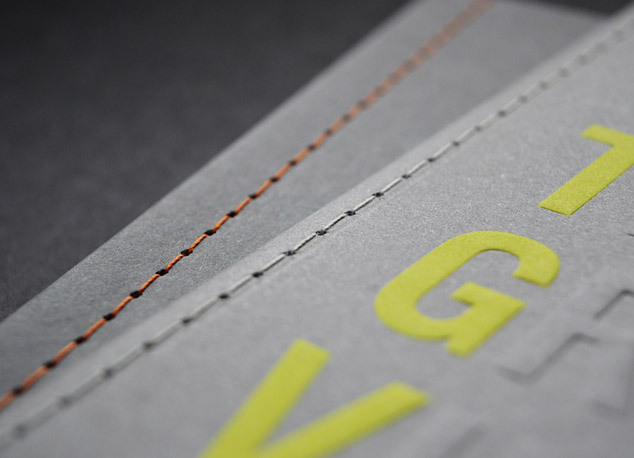 Folded text sections are inserted one inside the other on a saddle before a cover is dropped on top of them all. 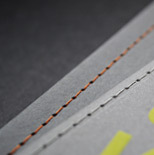 The whole document is then stitched together with wires along the back fold. 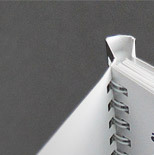 Although heavily influenced by stock weight, Saddle Stitching is most suitable for documents with fewer than 80 pages. 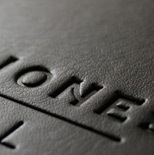 TIP: When designing work for a saddle stitch job, the final pagination of the document must be divisible by 4. The folded text sections which are inserted one inside the other are 4pp (4 printed page) sections. Therefore paginations need to be 8pp, 12pp, 16pp, 20pp, 24pp, 28pp, 32pp... and so on. Using thread and a sewing machine, Side Singer Sewing is a very elegant and unique way of binding your document. Singer Sewing holds the pages very securely whilst allowing them to be opened flat. 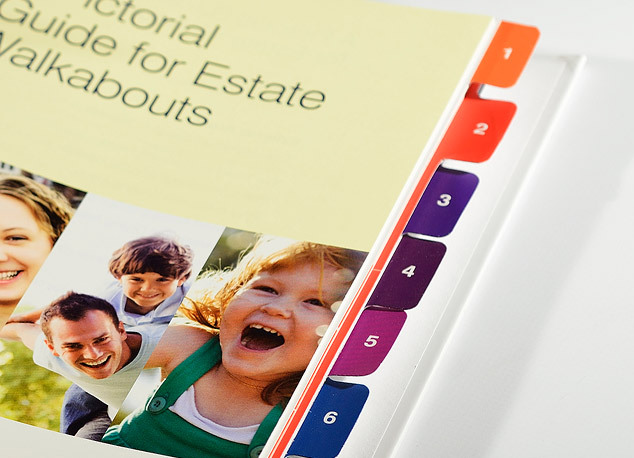 The thread can be an attractive design feature, with books sewn using either matching or contrasting colours - and can make your document stand out compared to more widely used binding methods. A large choice of thread colours is available and the finish can be cut-flush (the thread being trimmed neatly) or left hanging (the thread is left approximately 30mm beyond the book). 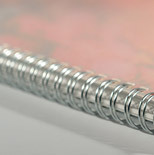 Loop Stitching is used for documents which may need to be attached into 2D ring binders. The process is produced exactly the same way as normal Saddle Stitching but, instead of getting a flush staple, you get two wire loops for affixing into a binder. Most common cover style. Separate front and back covers. Opens easily back to back. Full Canadian binding is a one piece cover. In its simplest form, the wire is exposed on the front and back cover, thereby providing a spine. 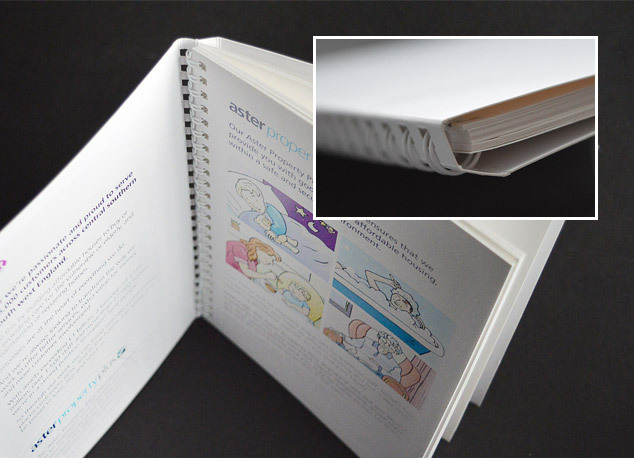 This binding method combines the open-flat benefits of wire binding with a printed spine. Half Canadian binding, by comparison, reveals the wire only on the back cover. 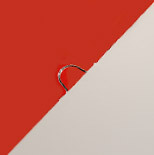 Half Canadian binding is a single piece cover that, in its simplest form, leaves the wire exposed on the back cover, thereby providing a spine. 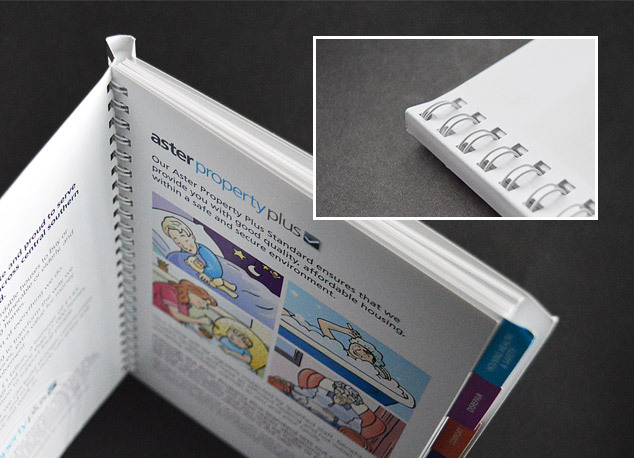 This binding method combines the open-flat benefits of wire binding with a printed spine. Full Canadian, by comparison, reveals the wire on the front and back covers. 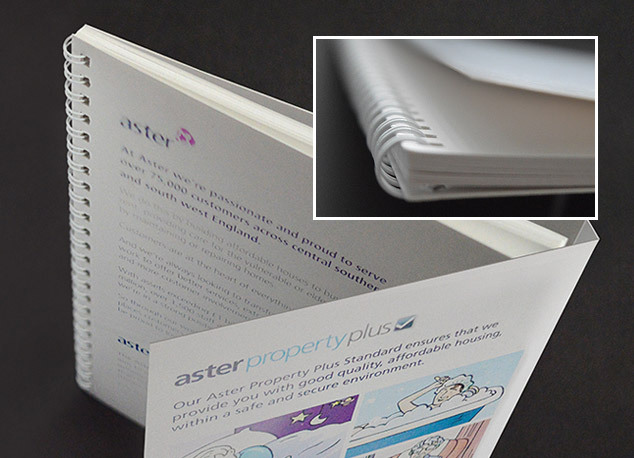 With Pocket Binding, the wire bound document is designed to slip into the cover sleeve. Standard Wiro Bound book, glued into a hard case and retaining all the opening advantages of standard wiro binding. 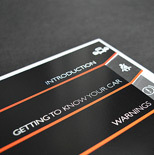 A single piece wrap-around cover with a permanent look. 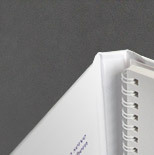 Binding appears on the spine of the book. 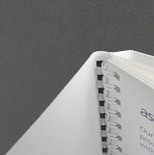 A wire-bound insert is pasted inside a one piece flat spine cover. 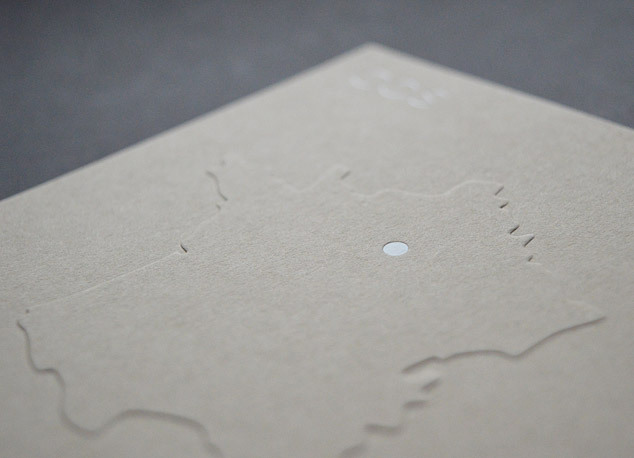 The binding is concealed and the spine can be printed. 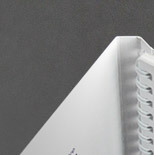 A one piece spine cover that opens in reverse, creating a flat spine for identification. 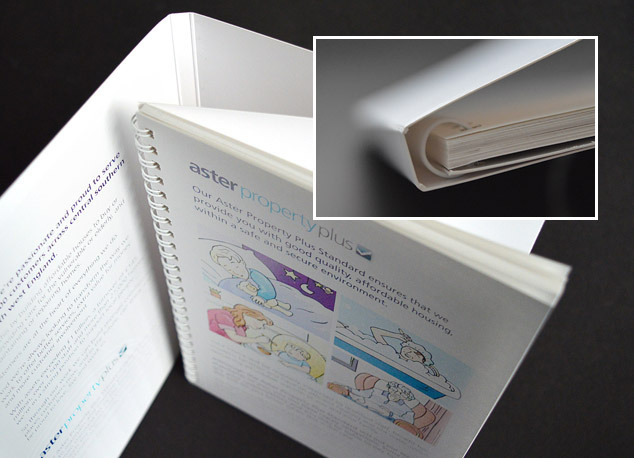 Reverse Binding allows for an expandable inside cover where a large spread image is important. 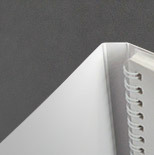 The binding is concealed and the spine is flat. The back flap can be glued down or left free. A free standing triangular cover. 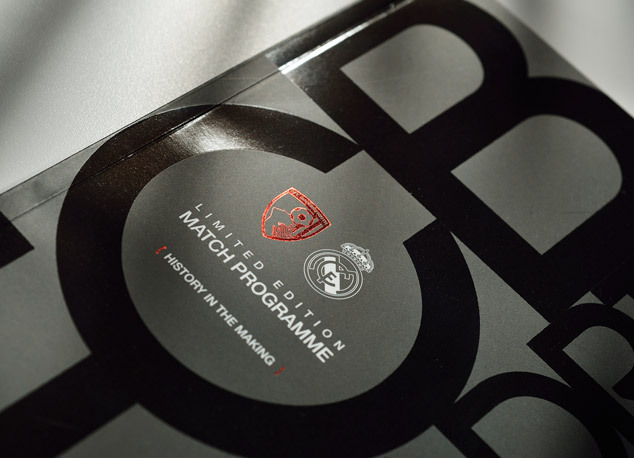 Commonly used with other print finishes such as Spot UV, Foiling and Lamination, Blind Embossing engages attention and gives the printing depth, providing a quality textural contrast to the selected areas. Tactile and highly effective, this beautiful technique literally makes selected areas of the design stand out from the sheet. 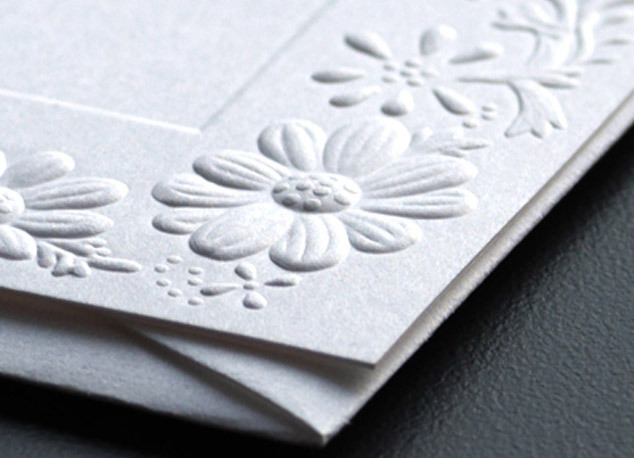 With its raised impression and 'I just want to feel it' character, embossing is a superb process to achieve a luxury finish. 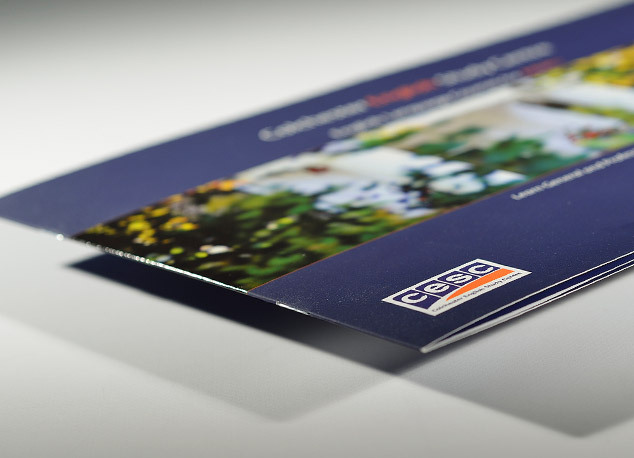 Debossing produces a sunken effect and is commonly used with other print finishes such as Spot UV, Foiling and Lamination. 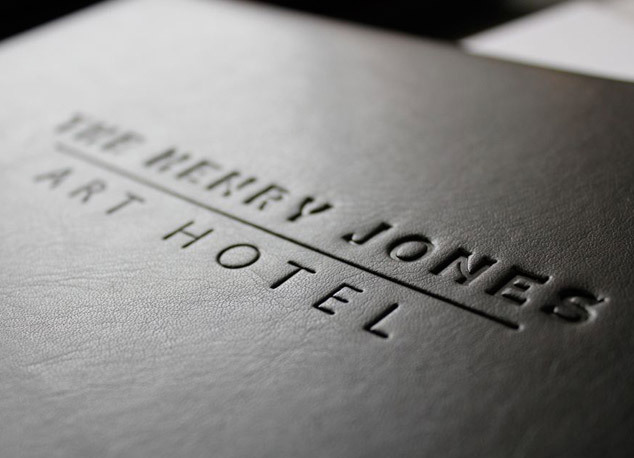 Like embossing, debossing engages attention and gives the printing depth by providing a quality textural contrast to the selected areas. 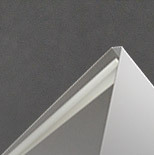 A highly effective and beautiful technique, it is a superb process to achieve a luxury finish. 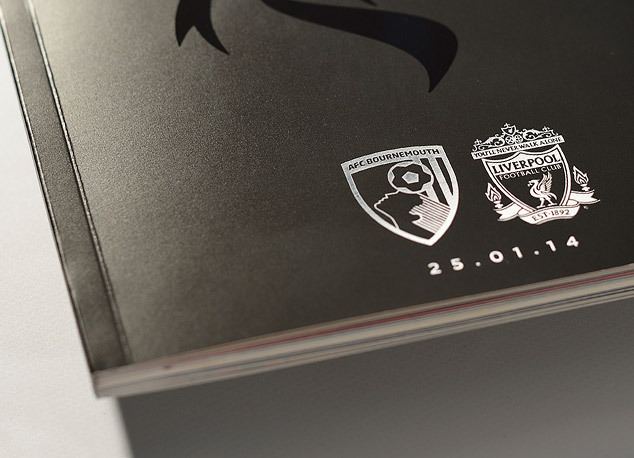 Registered Embossing creates the same effect as Blind Embossing but adds a raised appearance to a pre-printed image. 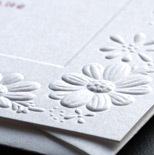 In addition to Registered Embossing other more traditional techniques include Pastel, Glaze and Scorched. 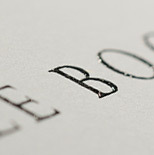 Registered Debossing creates the same effect as Blind Debossing but adds a sunken appearance to a pre-printed image. In addition to Registered Debossing other more traditional techniques include Pastel, Glaze and Scorched. Die cutting is used to cut out a shape which is not square or rectangular, i.e. not all edges are straight. 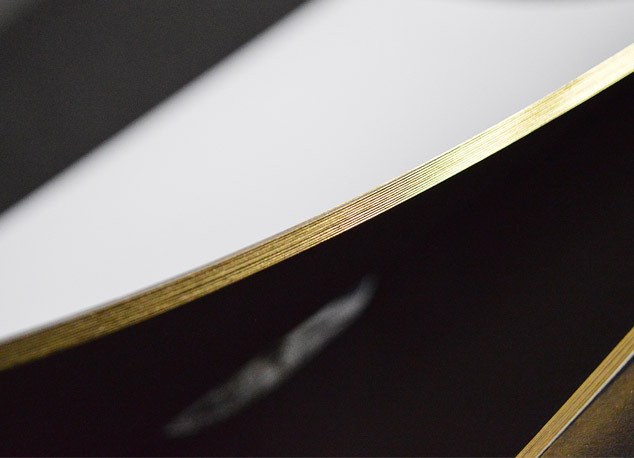 For example, rather than having an A4 brochure which is simply guillotined you may require curved edges to add an artistic appearance to the document. We would achieve this result by die cutting the product. 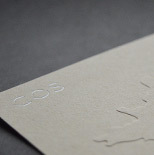 The process works using a die cutter. A die cutter is a wooden block which has blades bent to the required design housed in the surface of the wood. This die cutter is then pressed on to each printed sheet one at a time by machine, thereby cutting out the final required shape and size. Print items you would usually die cut include folders, business cards, flyers, tent cards, boxes, business card slots, angular cuts, curved edges and shaped or circular stickers. 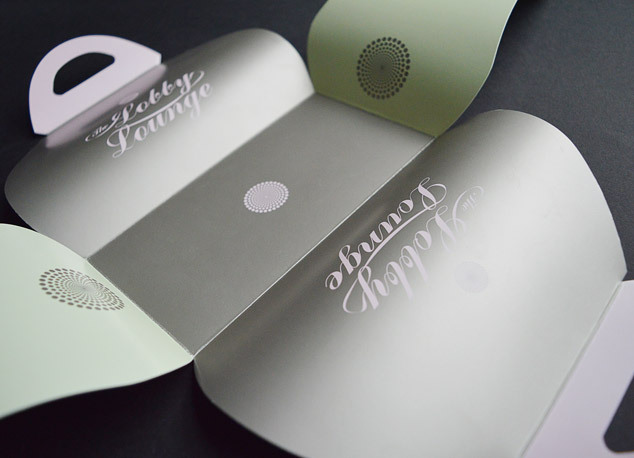 The application of foil to paper, foiling is the ultimate finish for decorative appeal. A heated die is stamped on to the foil, making it adhere to the surface of the paper, leaving the design of the die on the paper in foil. Even though they remain the two most popular colours, you are no longer restricted to just gold or silver. 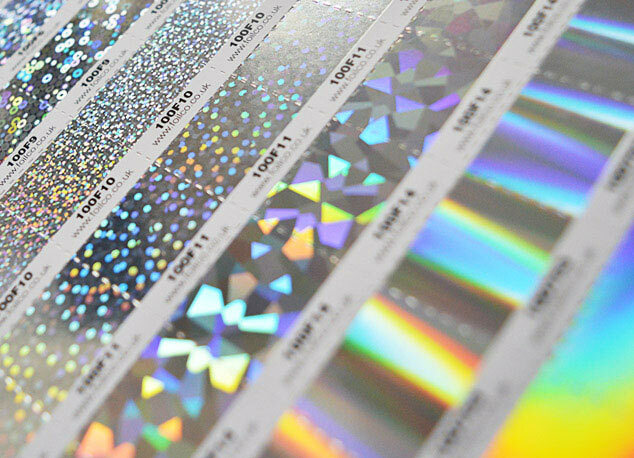 There is now an impressive range of pigmented, metallic, holographic, decorative and security foils available. 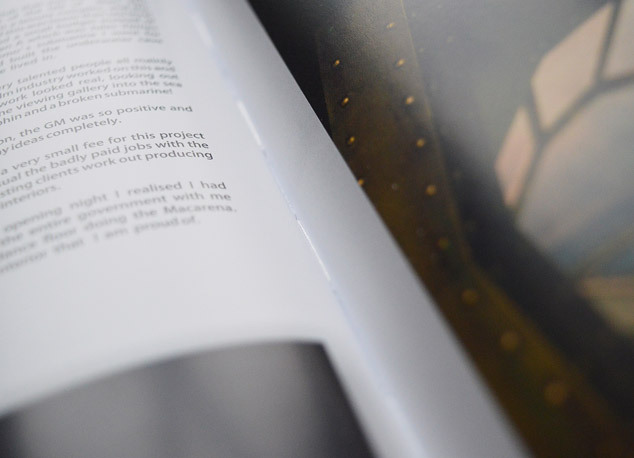 TIP: Combine foiling with other print finishes such as lamination or embossing to produce varying tactile effects and give additional impact to your document. 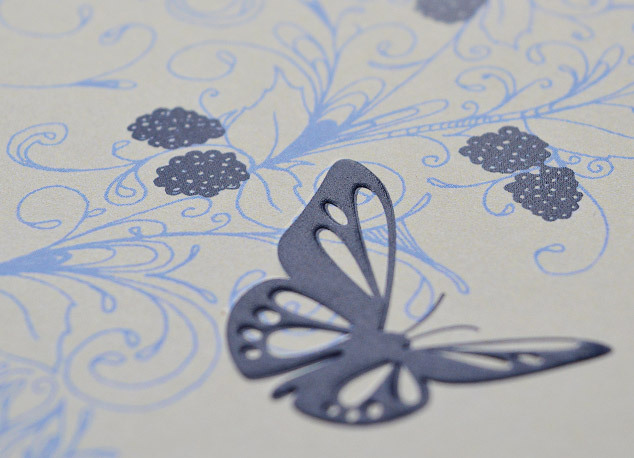 Embossing with foiling will create an image in foil standing proud of your page, which we have found to be very effective. 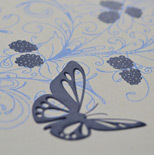 Using this on a good quality card with no additional print can be simple, elegant - and incredibly impactful. Metallic Foiling is the ultimate finish in decorative appeal. It is the application of foil to paper. 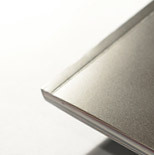 A heated die is stamped on to the foil, making it adhere to the surface of paper leaving the design of the die on the paper in foil. Nowadays you are not limited to just gold or silver foil, even though these are still the two most popular. 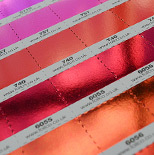 There is now an impressive range of metallic colours available to choose from. 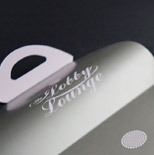 The application of foil to paper, Holographic Foiling is the ultimate finish for decorative appeal. A heated die is stamped on to the foil, making it adhere to the surface of paper and leaving the design of the die on the paper in foil. With an impressive range of holographic patterns to choose from, an array of spectacular finishes and effects can be achieved. 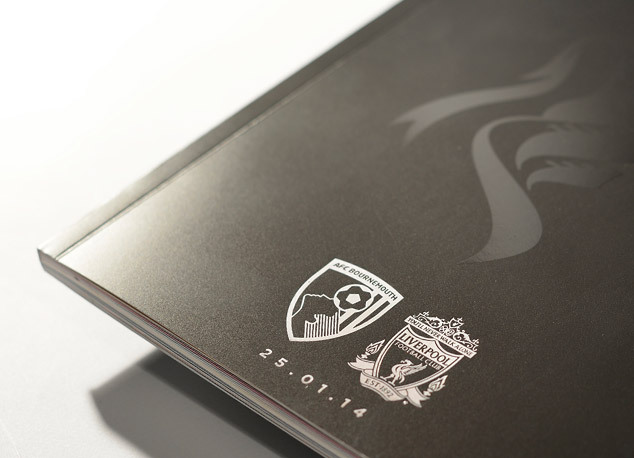 The application of foil to paper, Decorative Foiling is the ultimate way to create an unusual finish to your document. A heated die is stamped on to the foil, making it adhere to the surface of paper leaving the design of the die on the paper in foil. With an impressive range of patterns to choose from, an array of spectacular finishes and effects can be achieved. 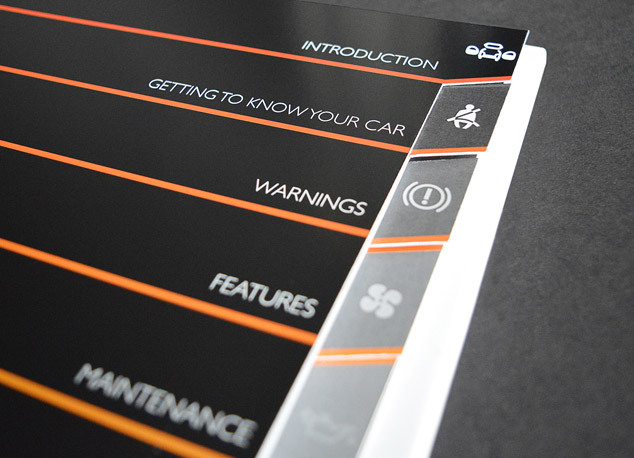 Used to increase the perceived value and quality of documents, Spot UV is a high-gloss varnish applied to specific areas of the printed page. It is also used as a device to highlight and draw attention to that part of the design you most want your customer / consumer to read. 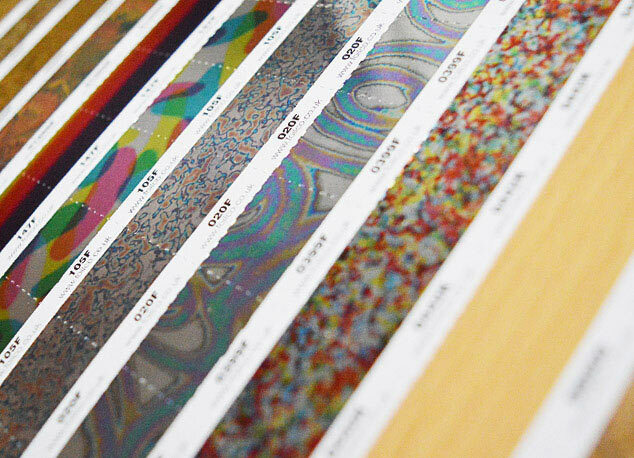 Spot UV can be added to any coated sheet as well as a coated sheet which has then been laminated. 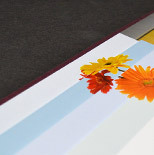 In this instance Spot UV would be added on top of the laminate so as to provide the additional visual stimulus of having varied textures on a single printed surface, some areas in a light-absorbing matt finish, others in reflective high-gloss. 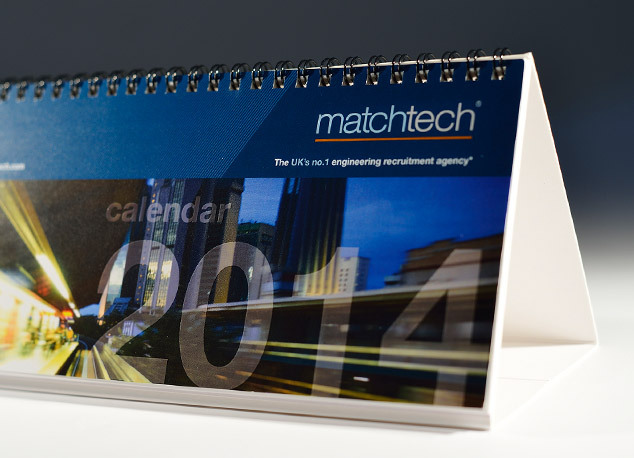 This can make a striking first impression on a presentation folder, brochure cover etc. 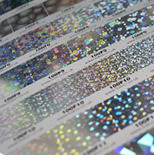 For alternative finished effects, Spot UV Varnish is also available in textured, sparkle and coloured finishes. 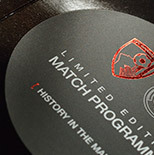 Thermographic printing can add a distinctive definition to colour and texture that cannot be achieved with other techniques. In its simplest form, it’s a raised thick ink with a gloss finish. The process entails adding a thermographic powder to wet ink immediately after it comes off the press. The sheets are then passed under a heater, causing the powder to melt, rise and then dry as solid. 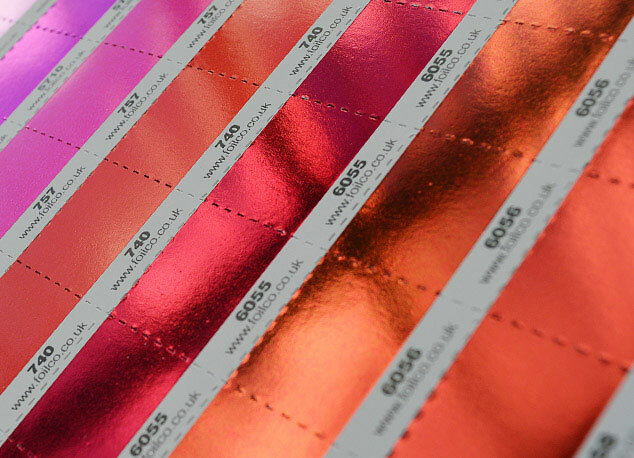 Using a clear powder enables to process to create raised text or images in any pantone colour. 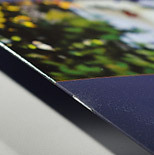 Once cooled, you are left with a rich and vibrant raised glossy image that looks outstanding. It adds an eye catching dimension to any design as well as being durable. Best of all, it’s unique and can lend a distinguished ‘Saville Row’ style to your document. 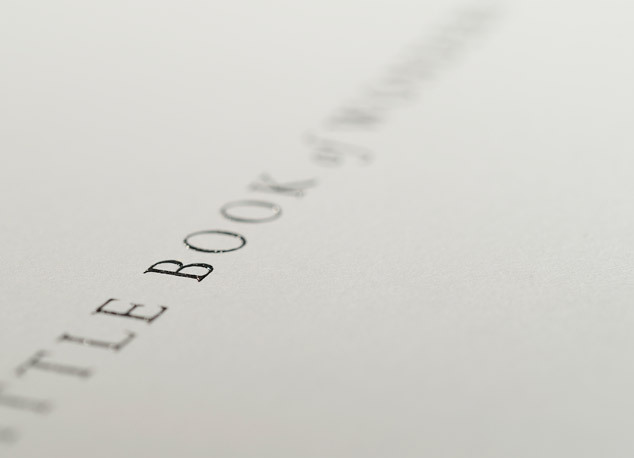 Gilding adds a very elegant finishing touch to any book. 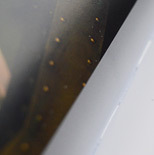 It is a process whereby each edge of the book is sanded and almost polished before applying a thin film of gold foil which is transferred to the book edge with a heated silicon rubber roll. Gilding can be simply for decorative reasons – however, it also protects the pages from the natural oils of the human hand… open an old book and see how the pages have discoloured. 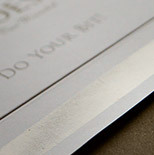 Gilding foil is available in silver and gold, matt or gloss. Step Indexing is the use of tabs or indexing to aid the location of specific information within a document. Their primary use is to aid the reader’s journey and the most widely used method is standard Step Indexing. There are, however, alternatives such as Thumb Indexing, Angled Step Cut and Waterfall Cut, all of which are attractive alternatives and would lend a unique look and functionality to your document. 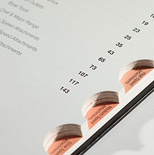 Thumb Indexing is a series of rounded indentations cut into the front edge of a book, each labeled to indicate different sections. The individual notches are called thumb cuts. 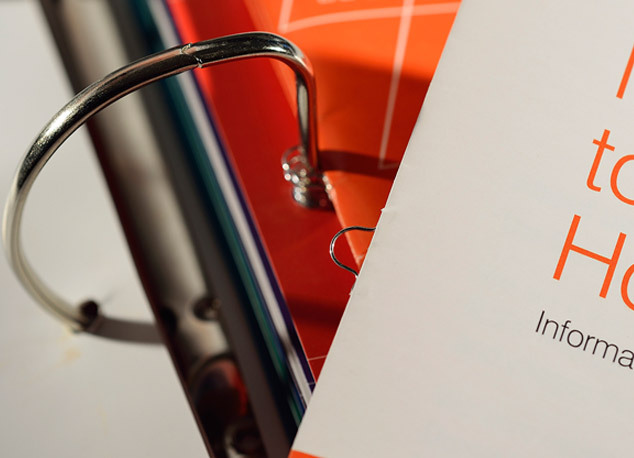 Angled Indexing is an alternative format to Step Indexing. This process is commonly used when a large amount of tabs are needed down the side of a document. Waterfall Indexing create tabs running from the head of the document down to the foot and can offer a greater area for graphics and imagery on each tab. Waterfall Indexing is an alternative format to Step Indexing. This process is commonly used when a large number of tabs are needed down the side of a document. Perfect for enhancing advertising and promotional materials through the sense of smell. 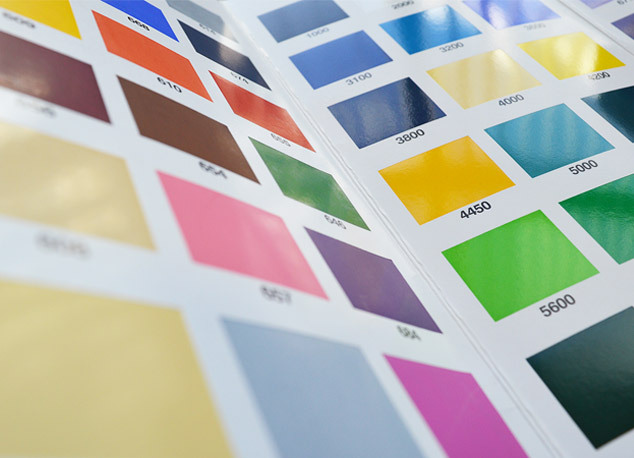 Integrated directly into the printing process as easily as a fifth colour or spot coating, this is applied as a colourless coating or varnish that releases a fragrance when the print is rubbed. 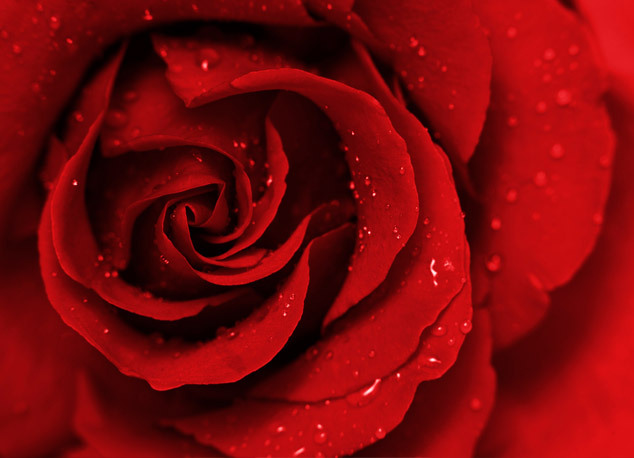 The fragrance is incorporated in microcapsules which can be ruptured once the varnish has been printed. 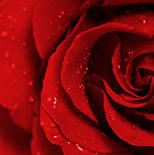 The fragrance can be released many times depending on the size of area covered and the intensity of use. Flowers, Fruits, Nature, Food… and more. 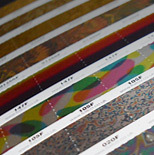 Latex ‘Scratch-off’ inks have widely been used in the industry on items such as scratchcards to conceal areas of print from the consumer. 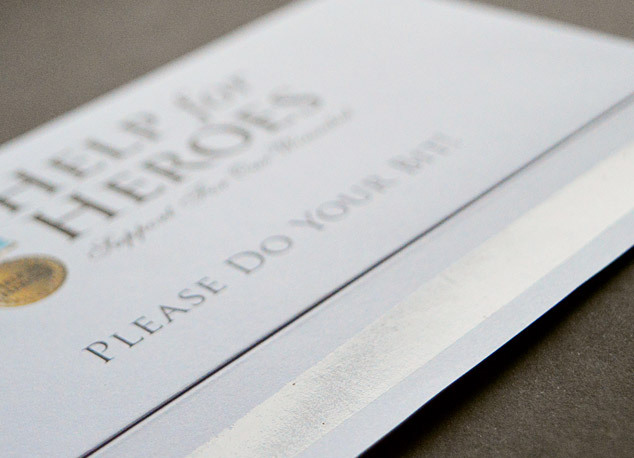 Applied to the printed sheet in the same manner as Spot UV or Foiling, these inks are readily removable using a coin or fingernail to display the pre-printed message or image underneath. The most common latex covering is metallic silver - however gold and other colours are also available. 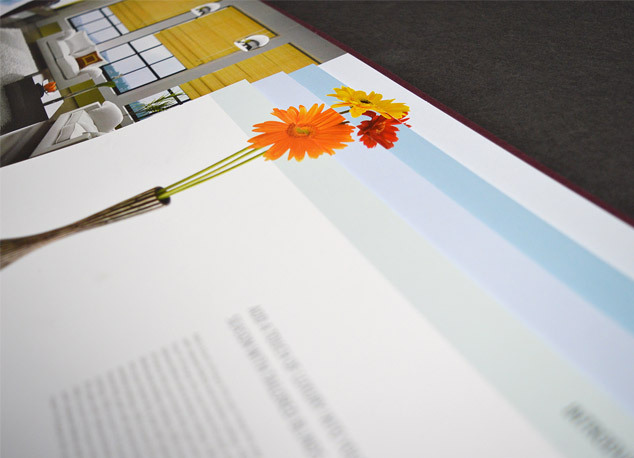 Laminations provide a clear 12micron film which is applied to the printed page with the aim of either protecting its surface from damage or to add an artistic effect to the finished document. 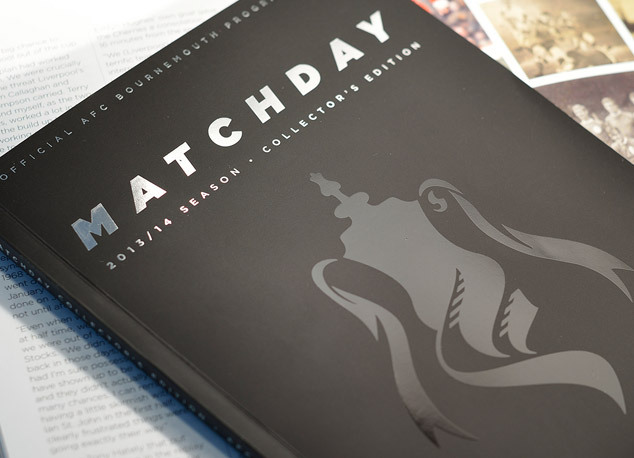 For example, the job could be printed on matt coated paper throughout, but then have a gloss laminate applied to the cover only, providing a contrasting finish. Silk, Soft Touch, Scuff Resistant… and more. Re-moist gum is an adhesive that allows perforated sections to be ripped from a document and then moistened for re-sealing and posting back to a return address. Re-moist gum is usually applied to forms or supply slips. It is sometimes called horseshoe adhesive because it forms the shape of a horseshoe around the reply slip.